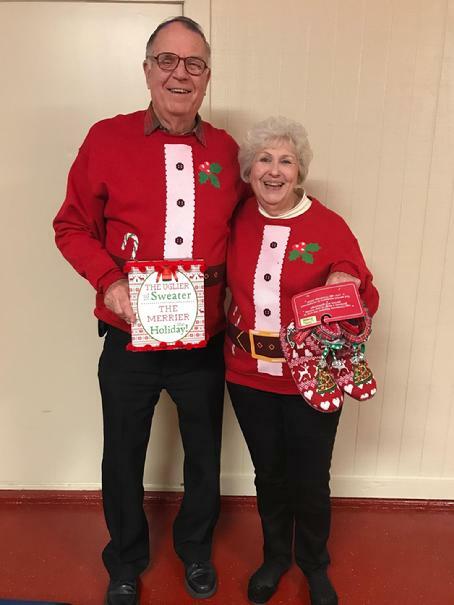 Robert and Lois Duzan were the winners of the "Ugly Sweater Contest" at the Sparks' Christmas Party. They were awarded prizes for their ugly sweaters. Robert received a plaque that stated, "The Uglier the Sweater, the Merrier the Holidays". Lois was awarded ugly slippers to wear with her ugly sweater to complete her wardrobe. We appreciate David & Jennifer Sparks for hosting the Church Christmas Party at their home. On December 21, 2017, some of the youngsters in the Crockett Road Church of Christ who are participating in the "Lads to Leaders" program went Christmas Caroling to some of the area nursing homes. Everyone had a great time, and it was so nice for the children and chaperones to make the Christmas holidays better for those who are less fortunate. After they finished caroling, Doug and Alison Rader invited everyone to their house for cookies and hot cocoa. Everyone had a great time. Several members of the church met together at Pam Galloway's house on Tuesday, December 12th to enjoy and evening together and to sign cards for the shut-ins. Pam prepared Taco Soup, Vegetable Soup and wassail for everyone and it was delicious. Everyone brought finger foods to go with the meal, and we had much more food than we could eat. Everyone had a great time. The Annual Christmas Party was held in the activity building on December 5, 2017. Sandy Singleterry hand made all of the decorations for the table centerpieces and also the other decorations. They were beautiful! Doug Sumrall donated all of the food for the meal and personally cooked all the briskets, hams, turkeys, sausages and beans for the dinner. The table settings were beautiful and the meal was delicious! We had 185 show up for the Christmas party, and everyone had a great time. Santa Claus even showed up for the kids!!!! We would like to thank Doug Sumrall, Sandy Singleterry, James Singleterry, Rita Taylor, Audrey Manuel, Betty Steen and Willette Rasure for all of their hard work in ensuring that the Christmas Party was a success. We appreciate each of you so much! The annual ladies Christmas Ornament Exchange was held on December 3, 2017 after the morning worship at the home of Henry and Sonda Baker. Sonda and Hailey Baker Brooks prepared and provided a delicious meal for all the ladies to enjoy before exchanging ornaments. There were about 35 present who were able to enjoy getting together for a great meal and even better fellowship. We really appreciate Sonda for hosting the ladies ornament exchange. Everyone had a great time. The church held its quarterly luncheon after the morning service on December 3, 2017. The "All Stars Banjo Band" had performed at the Dogwood Jamboree the previous evening, and they stayed in Palestine to worship with us and provide entertainment for the luncheon. We had a delicious meal of home cooked dishes which was followed by wonderful entertainment from the All Star Band. Everyone had a wonderful time. The ladies Bible class had their annual Thanksgiving Luncheon after their Bible class on November 14th. Each lady prepared a dish (or more) of some of most delicious food that you could ever care to eat. Husbands were invited to attend, and they were in for a real treat! Each and every dish was delicious! We love and appreciate the ladies of the Church. They have a great desire to learn more of the Bible and be the Christian that God wants them to be. The October Monday Night for the Master was held on October 30, 2017 in the Activity Building. We had a nice group who met to enjoy a meal together and then do various things around the building. We started the night off with a delicious salad that Sandy Singleterry made and pizzas from Mazzio's Pizza. Several of the ladies of the church brought desserts, and they were delicious! We had a total of 46 of our brothers and sisters in Christ who showed up for this month's worknight. It is so wonderful to be a member of a Church that has so many devoted and loving members. Our next Monday Night for the Master will be last Monday in January 2018. To enlarge a picture for viewing, just click on it. The annual "Trunk or Treat" was held after the evening services on October 29, 2017. Members of the church opened the trunks on their vehicles and handed out candy to the children of the church. Some of the adults even got into the Halloween spirit and dressed up! It was a great night for both the adults and the kids. We appreciate the youth of our church so much, and it was a lot of fun seeing them in their costumes. We really appreciate everyone who provided food for the children. The ladies Bible class stayed after class on October 10, 2017 and enjoyed a "Craft Day" together. Some of the ladies brought salads and desserts to go with the pizzas that Dan provided. After enjoying a meal together, they made and decorated crackle pumpkins for the fall season. There were between 15 and 20 ladies that stayed to enjoy time together. The annual Fall Festival was held on October 7, 2017 at Clint and Jonna Satterwhite's house. They made a maze with round bales of hay, but the kids spent more time on top of the hay than they did in the maze. There were several (I think 15) different booths that were set up for the kids to enjoy, and enjoy them they did! You can see many of these booths in the pictures to the left. It was so nice getting to see the children have such a good time. We appreciate everyone who set up a booth for the kids to enjoy. The fall festival seems to get better every year! We really appreciate Clint and Jonna for once again hosting this event. You can click on each picture to enlarge them. After the summer break, the Monday Night for the Master program started back on September 25, 2017. There were 33 Christians who enjoyed a meal together before working on various tasks for the church. We appreciate all of those who were willing to come and work together for the Lord. The Church had the annual Watermelon Supper after the evening services on July 2, 2017. We had a good crowd that stayed to enjoy ice cold Pennington Watermelons. There were close to 100 that stayed to enjoy the fellowship and watermelons. The East Texas Area Wide Youth Rally for the last week of June was held at the Crockett Road Church of Christ on June 27, 2017. These weekly rallies have teens from Lovelady, Livingston, Crockett, Lufkin, Oak Grove, Groveton, and Crockett Road (and probably others) that travel each Tuesday to worship with each other. The singing was really beautiful, and we appreciate Mike Hortman (from Angelina Church of Christ) for leading everyone in song. We also appreciate Ben Rhone, youth minister at Crockett Road Church of Christ, for bringing the message. After the worship service, everyone enjoyed a meal of grilled hamburgers that was furnished and cooked by Doug Sumrall. We really appreciate everyone who attended and those who helped make this event a success. On May 22, 2017, we had our last Monday Night for the Master before the summer break. We had a total of 36 people who participated as we signed cards and did other much needed things around the church. We appreciate James & Sandy Singleterry, Shelly Franklin and Rita Taylor for arriving early and getting all the food ready for everyone. We had a great meal! (Just look at the pictures and see all the good food!) Once again, we had some delicious desserts prepared by the ladies. We had some of the best homemade banana pudding and peach cobbler that you could imagine! We would like to thank everyone who made the effort to come and help do the work of the church. You can look at the pictures and see many of those who were willing to work. We appreciate it, and our Lord appreciates it too! We had 28 people participate in the April Monday Night for the Master that was held on April 24, 2017. We had a meal of pizza, salad, and some of the best desserts that you could imagine before going to work. We really appreciate all the ladies of the church who make desserts each month for our lunch that we have before our worknight. Everyone had a great time, and we got a lot of work done. We would like to thank everyone who comes to help do the work of the church. We Love each one of you. David and Jennifer Sparks hosted an Easter Egg Hunt for the children of Crockett Road Church of Christ, ages newborn through 3rd grade at their home on April 15, 2017. Not only did they open their home to everyone, but they also provided a wonderful breakfast for those who attended. Jennifer read a story telling everyone the "True" meaning of Easter as she told the story of how Jesus was crucified and rose from the dead 3 days later! After the story, all of the children got to hunt Easter eggs. There were 480 eggs hidden for the kids to find, and every child had a blast! They even got to see the Easter Bunny (aka David Sparks). It was a great day! We appreciate David and Jennifer so much for all they do for the church and for others. Not only did the kids have a great time, but the adults did too. The March 2017 Monday Night for the Master was held on March 27th. Everyone was in for a treat as Sandy Singleterry made over 100 home made enchiladas for the workers! In addition to the enchiladas, several ladies in the church brought desserts! Everything was delicious! We had almost 50 people who showed up for the meal and the work afterwards! We really appreciate everyone who was willing to come and work for the church. We have a wonderful body of believers at Crockett Road, and it is great to belong to a church where there are so many who are willing to work for the Master. The February Monday Night for the Master had over 50 people who came to fellowship and work for the church. We had a meal where you could build your own tacos (either crispy or soft flour). The ladies of the church brought all kinds of wonderful desserts to go with the meal. We really appreciate everyone who came and brought food, and also those who came to work. It was a great night! The Crockett Road youth held a chili supper on February 19th after the evening worship service. The chili was free to anyone who wanted to eat, and we had a good number who stayed for the event. There were 10 different entries in the chili supper competition. Each person who attended was given three tickets and were told to put tickets in the bag in front of their favorite chili. Jennifer Sparks was the first place winner. Audrey Manual won second, and Gayle Hamilton won third. All three were presented with aprons, and Jennifer was presented a plaque for winning first place! 24 women of the church baked cakes & desserts to be sold in a friendly "silent auction" which took place during the chili supper. The event was free to everyone, but we have such a loving congregation that over $3,100 was given for the youth. We appreciate all who donated to the chili supper and the youth of our church. The men of the church got together for a Men's Breakfast on February 11, 2017. There were 24 men who showed up for the breakfast and many hung around afterwards to help do some much needed work around the church. We appreciate all the men who came early to cook for the group and all of those who worked at the church after the meal.